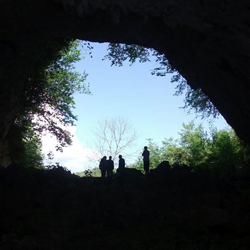 Populations of hunter-gatherers weathered Ice Age in apparent isolation in Caucasus mountain region for millennia, later mixing with other ancestral populations, from which emerged the Yamnaya culture that would bring this Caucasus hunter-gatherer lineage to Western Europe. This new lineage stems from populations of hunter-gatherers that split from western hunter-gatherers shortly after the ‘out of Africa’ expansion some 45,000 years ago and went on to settle in the Caucasus region, where southern Russia meets Georgia today. Here these hunter-gatherers largely remained for millennia, becoming increasingly isolated as the Ice Age culminated in the last ‘Glacial Maximum’ some 25,000 years ago, which they weathered in the relative shelter of the Caucasus mountains until eventual thawing allowed movement and brought them into contact with other populations, likely from further east. This led to a genetic mixture that resulted in the Yamnaya culture: horse-borne Steppe herders that swept into Western Europe around 5,000 years ago, arguably heralding the start of the Bronze Age and bringing with them metallurgy and animal herding skills, along with the Caucasus hunter-gatherer strand of ancestral DNA – now present in almost all populations from the European continent. “The question of where the Yamnaya come from has been something of a mystery up to now,” said one of the lead senior authors Dr Andrea Manica, from Cambridge’s Department of Zoology. Previously, ancient Eurasian genomes had revealed three ancestral populations that contributed to contemporary Europeans in varying degrees, says Manica. Following the ‘out of Africa’ expansion, some hunter-gatherer populations migrated north-west, eventually colonising much of Europe from Spain to Hungary, while other populations settled around the eastern Mediterranean and Levant, where they would develop agriculture around 10,000 years ago. These early farmers then expanded into and colonised Europe. Lastly, at the start of the Bronze Age around 5,000 years ago, there was a wave of migration from central Eurasia into Western Europe – the Yamnaya. However, the sequencing of ancient DNA recovered from two separate burials in Western Georgia – one over 13,000 years old, the other almost 10,000 years old – has enabled scientists to reveal that the Yamnaya owed half their ancestry to previously unknown and genetically distinct hunter-gatherer sources: the fourth strand. By reading the DNA, the researchers were able to show that the lineage of this fourth Caucasus hunter-gatherer strand diverged from the western hunter-gatherers just after the expansion of anatomically modern humans into Europe from Africa. The Caucasus hunter-gatherer genome showed a continued mixture with the ancestors of the early farmers in the Levant area, which Manica says makes sense given the relative proximity. This ends, however, around 25,000 years ago – just before the time of the last glacial maximum, or peak Ice Age. At this point, Caucasus hunter-gatherer populations shrink as the genes homogenise, a sign of breeding between those with increasingly similar DNA. This doesn’t change for thousands of years as these populations remain in apparent isolation in the shelter of the mountains – possibly cut off from other major ancestral populations for as long as 15,000 years – until migrations began again as the Glacial Maximum recedes, and the Yamnaya culture ultimately emerges. “We knew that the Yamnaya had this big genetic component that we couldn’t place, and we can now see it was this ancient lineage hiding in the Caucasus during the last Ice Age,” said Manica. While the Caucasus hunter-gatherer ancestry would eventually be carried west by the Yamnaya, the researchers found it also had a significant influence further east. A similar population must have migrated into South Asia at some point, says Eppie Jones, a PhD student from Trinity College who is the first author of the paper. “India is a complete mix of Asian and European genetic components. The Caucasus hunter-gatherer ancestry is the best match we’ve found for the European genetic component found right across modern Indian populations,” Jones said. Researchers say this strand of ancestry may have flowed into the region with the bringers of Indo-Aryan languages. Inset image: the view from the Satsurblia cave in Western Georgia, where a human right temporal bone dating from over 13,000 years ago was discovered. DNA extracted from this bone was used in the new research. DNA was extracted from the molar teeth of this skeleton, dating from almost 10,000 years ago and found in the Kotias Klde rockshelter in Western Georgia.